Ceiling Fans add beauty and function to just about any room in the house. Whether you have low or high ceilings, small or large rooms, you can enhance your living room, master bedroom, office, den, dining room, kitchen or kid’s room with a new ceiling fan. Orr Electrical’s local electricians are licensed and bonded and do your ceiling fan installation job correct the first time. 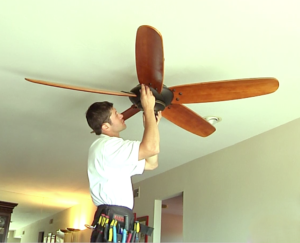 Our technicians at Orr Electric are experts at ceiling fan installation and electric repair and you can always trust us to get the job done the right way, the first time.